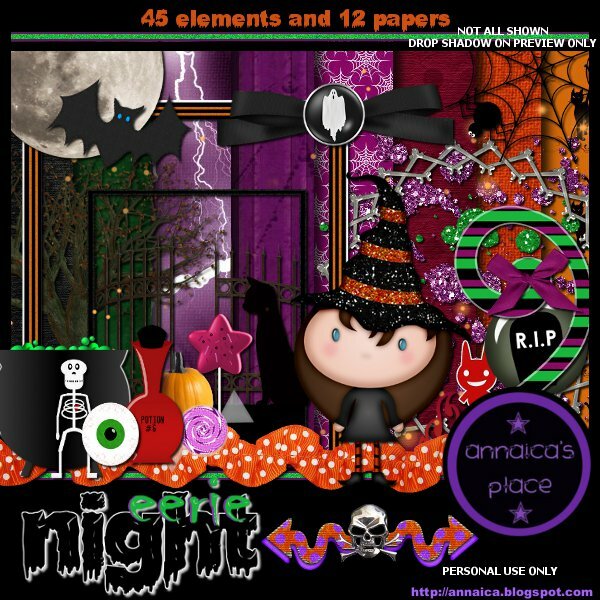 ♥ I Love Lucy DigiArt Designs ♥: EERIE NIGHT NOW FTU! This kit has been in stores until NOW :) I am letting all my friends have a copy! It is PERSONAL USE ONLY. A Halloween themed kit for taggers to play with! There are plenty of possibilities with this kit. Witches brewing potions with black cats and spiderwebs everywhere... what an Eerie Night! All I ask is that you say THANKS if you end up downloading! I'd LOVE to see all you make with it :D Tag me on Facebook- www.facebook.com/annaicas.place or email me at iloveluci09@gmail.com Please read the TOU in download, and do not share this link, direct others here to my blog to download themself... Just click HERE to get your copy. Thank you so much for this great kit.I can't wait to see what I can come up with using it! Thank you so much for this post. I want to let you know that I posted a link to your blog in CBH Digital Scrapbooking Freebies (please, notice the new url for my blog), under the Page 1 post on Sep. 18, 2012. Thanks again. Fantastic kit! I especially like the lightning papers - so unique! Thank you for your generousity. Thank you! beautiful witch girl!! Beautiful Halloween kit! Thanks Anaika! Thank you for the awesome kit!! This is great - thank you so much for sharing!